An aerial count of wildlife provides encouraging news on animal numbers in Kenya, although the news is mixed for the endangered Grevy’s zebra. The Grevy’s zebra (Equus grevyi), also known as the imperial zebra, is the most threatened of the three species of zebra, the other two being the plains zebra and the mountain zebra. It is found in Kenya and Ethiopia. The important five-yearly survey found that their numbers were continuing to decline, but the rate of decrease had slowed. The official aerial survey took in the savannah ecosystems of the Laikipia-Samburu-Marsabit, Meru Conservation Area and Mwea National Reserve. 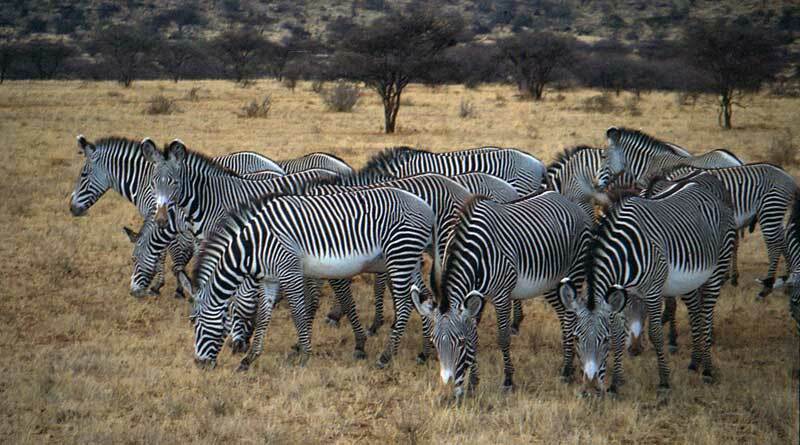 A total of of 1621 Grevy’s zebras were recorded, compared to 1897 in 2012 and 2400 in the 2008 census. Kenya’s Minister for the Environment and Natural Resource, Judi Wakhungu, said the figures showed that the annual rate of Grevy’s Zebra decline has slowed from about 5% between 2008 and 2012 to 3% between 2012 and 2017. This, she said, suggested that conservation efforts by the Kenya Wildlife Service and its partners were on track for a population increase in the future. “I am happy we are winning in saving this endangered species,” she said. The news was better for other important species that live on the savannah, the aerial survey of which covered 61,816 square kilometres. A total of 7347 elephants were counted, compared to 6454 in 2012. This represented an increase in the elephant population in the Laikipia-Samburu-Marsabit ecosystems of 12% over the last five years. The annual increase during this term worked out at 2.4%. In the Marsabit ecosystem, the population of elephants increased by 51%, from 89 elephants in 2012 to 181 today. A total of 76 elephant carcasses were recorded during the survey. The “very old” elephant carcasses made up the highest proportion, at 75%, followed by old carcasses at 25%. Overall, there was about a 1% carcass ratio for the Laikipia-Samburu-Marsabit ecosystem when compared to the number of live elephants. There were no fresh or recent carcasses recorded during the survey. The survey indicated that the ecosystem supported a large number of giraffes, totaling 4223 giraffe compared to 2839 giraffes in the 2012 census. Wakhungu said the wildlife census was an expensive exercise that required a lot of resources and expertise. She said she was aware that both the savannah and forested ecosystems faced the challenges of illegal tree logging, livestock incursions, charcoal burning, poaching for bush-meat, medium size snares and elephant traps. She said the ministry would continue to work with other government agencies and departments as well as conservation organizations and others to provide short and long-term measures to promote sustainable conservation of Kenya’s Wildlife.